Back Bay Books, 9780316181020, 352pp. According to renowned defense attorney and Harvard law professor Alan M. Dershowitz, "abuse excuses" are enabling people to get away with murder - literally. From the Menendez brothers to Lorena Bobbitt, more and more Americans accused of violent crimes are admitting to the charges, but arguing that they shouldn't be held legally responsible. The reason: they're victims - of an abusive parent, a violent spouse, a traumatic experience, ethnic hatred, society at large, or anything else - who struck back at a real or perceived oppressor. And they couldn't help themselves, they say. In this provocative and important collection of essays, Dershowitz reviews a wide range of recent cases - including those of O. J. Simpson, Tonya Harding, and Woody Allen - and argues that the current vogue in victim defenses is antithetical to the ideals of our constitutional democracy. 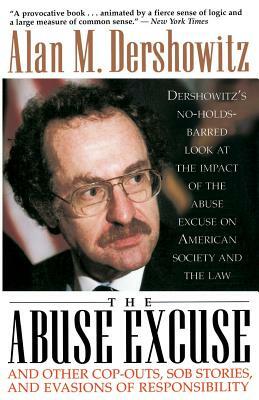 For Dershowitz, the foundations of American society are individual responsibility and the rule of law. And people who claim to be above the law - whatever the excuse - are no more than vigilantes.